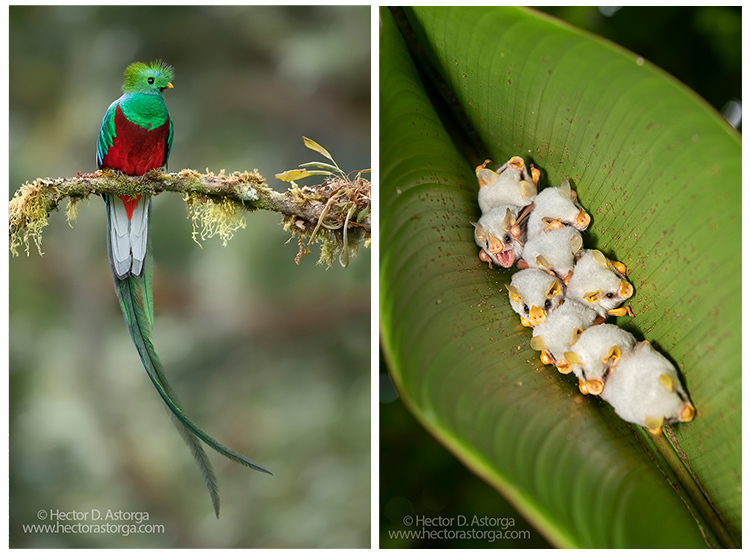 Tropical Birds, Rainforest Frogs, Bats, Hummingbirds & the Resplendent Quetzal. Come and join me and Costa Rican nature photographer Jeffrey Muñoz as we visit our favorite spots to photograph rainforest and tropical birds. hummingbirds, bats, rainforest frogs, and the Resplendent Quetzal. Our tour starts in the lowland areas of Costa Rica (Caribbean Side). We will target Toucans, King Vultures, multiple species of Honey Creepers, Parrots, Tanagers, etc. During this tour we will also photograph Bats in Flight using multi-flash setups. We then visit the Sarapiqui area where Rainforest frogs will be our targets. 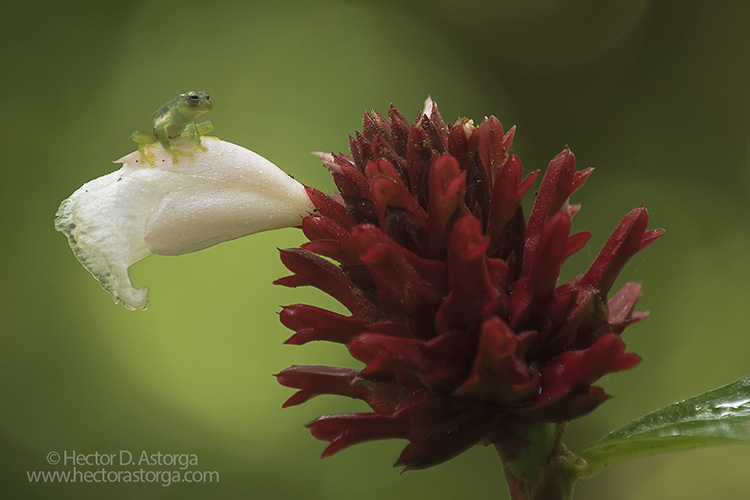 Red-eye tree frogs, poison dart frogs, glass frogs, and other species will be photographed here. At Sarapiqui we will also target Gray-necked Wood rails, Boat-billed Herons, Owls and many more birds. Honduran tent bats are easily found here and we'll hike into the forest to find them. One afternoon will be spent doing multi-flash setups photographing hummingbirds in flight. Up to 10 different species frequent the location we will be using. Our last stop will be the highland area of Talamanca. The superstar of Talamanca is the Resplendent Quetzal. One full day will be spent visiting locations where these wonderful birds live and nest. Plenty of photographic opportunities to capture one of Central America's most beautiful bird. We will photograph 3 different species of highland hummingbirds here in Talamanca. Both natural light and high speed multi flash setups will be used to capture the hummers. Day 1 - San Jose. Our private transportation will pick you up at the airport and take you to your Hotel in San Jose. Overnight at San Jose. This is an amazing destination that literally can guarantee all these beautiful birds. Our day will start with an early breakfast at our hotel; followed by a bus ride to the lowlands of the Caribbean side of CR. Our bus route will take us throughout the countryside and farming areas. Upon our arrival we will get ready to start shooting and becoming familiar with the photography conditions of the tropics. Our Biologist/Photographer guides will be there at all times helping you with this. Overnight at the same photography location. All meals and entrances are included. Day 3 - Lowlands of the Caribbean side - Full Day. Today the group will split into 2 sections. In the morning part of the group will visit a private garden for a variety of colorful small and medium size birds. The other half will remain at the lodge shooting for medium and large species birds. Mid morning dedicated to the King Vulture hide; in the afternoon the groups will switch locations, providing equal opportunities for everyone since there is constant birding activity all day at both shooting sites. At night one half of the group will photograph bats in flight using multi-flash setups. Overnight at the same photography location. All meals and entrances are included. Day 4 - Lowlands of the Caribbean side - Full Day. Today the group will split in 2 again; same plans as the day before but this time those who went in the morning to the private garden will go in the afternoon and vice versa. So in the morning, part of the group will visit a private garden for a large variety of colorful small and medium size birds. The other half will remain at the lodge shooting for medium and large species birds, Mid morning dedicated to the King Vulture hide; in the afternoon we will switch groups again, giving equal opportunities for everyone since there is constant birding activity all day at both shooting locations. At night the other half of the group will photograph bats in flight using multi-flash setups. Overnight at the same photography location. All meals and entrances are included. Day 5 - Lowlands of the Caribbean side - Sarapiquí. The day will start with a nutritious breakfast and a final opportunity to get another 1000 photos of all the beautiful tropical birds that visit our lodge facilities. Around midmorning we will depart to our new destination. After our arrival we will enjoy a delicious lunch and will get ready for photographing hummingbirds in flight. There will be around 10 different species of hummingbirds including the Violet Sabrewing, Rufous tailed, Black bellied, Green Hermit, and other species. We will have two multi-flash stations for participants to use. Overnight at Sarapiqui area hotel. All meals and entrances are included. After breakfast we transfer to our location for macro photo session of frogs. There will be many species of frogs in their natural habitat with a controlled environment for photography. You will see the famous “Red-eyed tree frog” to the little “Glass frogs” whose bodies are transparent. Many species of poison dart frogs will be also available for photography. We will work also with composition using the flowers and different elements that we will find at this amazing place. After lunch we will meet a wonderful local naturalist who has a “piece of paradise” where we will spend the afternoon shooting Gray-necked Wood rails, Boat-billed Herons, Owls and many more birds. These birds will be easy to find and photograph. For the remainder of the day we will “follow” him to shoot what he has found in the lands surrounding his properties. We never know exactly what we will get to photograph but there are always amazing surprises waiting for us. Overnight at the same photography location. All meals and entrances are included. Day 7 - Sarapiquí - Talamanca Area (Highlands of Costa Rica, highland birds, hummingbirds and Quetzals). It is time to change destinations to the Cloud Forest of Costa Rica. This area will offers a completely new variety of species and photo opportunities. Here we will photograph beautiful hummingbirds to the amazing Quetzal. After a delicious lunch, the fun will begin as we start shooting hummingbirds in natural light using perched setups. Overnight at the same photography location. All meals and entrances are included. Day 8 -- Talamanca Area - Full day. Everyone will be ready for another photography adventure! This time our morning starts with the Famous Quetzal Quest. We will spend the entire day looking for and shooting the amazing Resplendent Quetzal. Overnight at the same photography location. All meals and entrances are included. Day 9 - Talamanca Area – San Jose. This morning there will be one more session of hummingbirds in flight and highland bird photography to complete our final photography day in Costa Rica. We will photograph using multi-flash set ups and natural light set ups. After lunch we depart back to San Jose. We will have our last and farewell dinner at the San Jose hotel. Overnight in San Jose. All meals and entrances included. Day 10 - San Jose - San Jose International Airport. After breakfast a private transfer will take you to the international airport. End of our services. Breakfast included. - Lodging during our tour. - All meals as specified. - Airport Transfers on first and last day. - Photographic instruction and guidance by both co-leaders. - Multi flash setups for hummingbirds and bats. - Private transportation through out the tour. - Airfare to and from San Jose, Costa Rica. - Dinner the first night. - Personal items (souvenirs, batteries, etc). - Gratuities for local guides, porters, wait staff and drivers. We are limiting the number of photographers to 8 (for a 4:1 participant to instructor ratio) so you can get our full attention and be very comfortable at all shooting locations and during transport with your photo gear. A $2000 deposit is required at the time of enrollment with full payment due by September 1, 2019. We are not responsible for any fees associated with non-refundable air travel, we highly recommend the purchase of travel insurance. For insurance quotes and estimates visit www.insuremytrip.com.